Alison Hartley (No.17 in the list of female British team members) was born in Milton Keynes on 8th August 1967. Her father, Brian Hartley, was a well known figure within the sport and had himself managed a third place in the 1968 5 Mile British Championship. From an early age Hartley started to compete initially racing for Alexandra Palace in the early 1970's, albeit on a very infrequent basis. Junior girls racing was very sporadic at that time and more often than not events for girls were overlooked. In fact, the first British Championship event for Junior Boys was held in 1961, whereas in contrast, the first Junior Girls British Championship was not until 1977. 1977 was also the year that Hartley decided to take the sport a little more seriously, even though she was just 9 years old. It was also the time when she and her family switched from the Alexandra Palace club and set up their own club in their home town of Milton Keynes. Joining them at the newly formed Milton Keynes club was another youngster, Lisa Smith. Little did these girls (or anyone else for that matter) know at the time, but their intense rivalry would be the catalyst that would see both skaters become World Championship medallists and two of the most successful British women skaters ever to have taken to a track. In fact, Hartley's first medal was a silver to Smith's gold in a Junior Girls 500 metres handicap held by the NSA (National Skating Association) at Leicester's Granby Halls. In 1979 Hartley's father could see that his daughter's potential needed to be harnessed and worked upon. At that time the Mercia Roller Speed Club was firmly establishing itself as the best in the country. Amongst it's members were recent European Champions John E. Fry, John Mullane and Patrick Feetham, as well as host of other talented and experienced skaters. Brian took the decision to move away from the Milton Keynes club and firmly plant his family in the midst of world class skaters. He, Alison and his son Richard, joined Mercia in time for the 1979 season. The result was that the Milton Keynes club folded and from that a new club was formed, New City Rollers, and one of their shining stars was Lisa Smith. For the first time Hartley and Smith were no longer team mates and the scene was set for decade of skating rivalry. 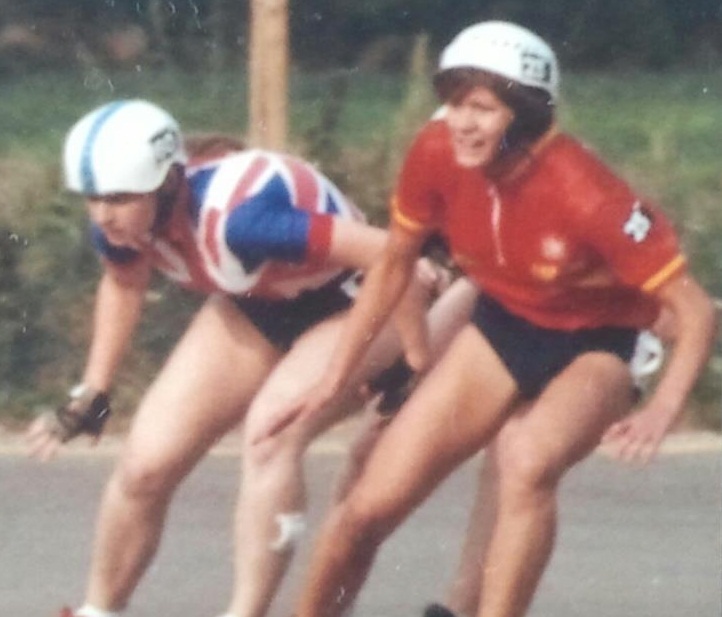 By 1981 Hartley had succeeded in getting herself noticed and was selected to represent Great Britain in the Junior European Championships in Pamplona, Spain. It would be the start of an illustrious international career. On 20th June 1982 aged 14 she won her first Junior British medal and with it a national title, the 2000 metres on Tatem Park. Three weeks later and she secured a silver in the 500 metres. Just one year later, 1983, she would take the senior ladies category by storm. Not yet 16, she had specifically requested that she could race in the senior category "early" and in time for the up and coming British Championships. The Roller Speed Committee looked upon her request favourably and almost immediately she was winning medals. First up was the Open Handicap Championship, the Vi Kirby Trophy at Tatem Park. Given a generous handicap of 45 metres, Hartley duly won the event. Later that day she also helped the Mercia Roller Speed Club take the Ladies British Relay Title alongside Sharon Tongue, Anita Collins and multiple British Champion and World medallist, Chloe Ronaldson - who had recently joined Mercia from Alexandra palace in what was to be her "swansong" Championships. A week later on 24th July the British Championships moved to Palmer Park, Reading. It was here that Hartley took her first Senior title by winning the 1500 metres and helped tem mate Sharon Tongue take gold in the 5000 metres, herself finishing second. Just a week on from that and again Hartley was winning Championship medals. It was back to Tatem Park for the final round of Championships and whilst not known for her sprinting abilities she secured a bronze medal in the first ever 300 metres time trial. Hartley rounded off the 1983 Senior British Championships with gold in the 3000 metres, and she was still only 15! Her efforts and performances in that year's Championships meant that she was selected to represent Great Britain at senior level for the forthcoming European Championships that were being held in Cremona, Italy. On the track she would manage 5th in the 1500 metres and manage 6th on the road in the same distance. In fact she would finish in the top 10 in four out of the five distances she skated on the road, a fantastic achievement for the relatively inexperienced 16 year old. Britain did not send a team to the World Championships in 1983 due to them being in Mar del Plata, Argentina, a country who we had only recently defeated in the Falkland's War. Hartley, therefore, had to wait another 12 months before she could have a crack at a World title. Before that, though, there were British titles to contend. In the 1984 British Championships, once again, Hartley was the woman of the moment. Winning gold in three of the four Championships and taking silver in her "Achilles heel" event the 300 metres. With the World Championships being held in Bogota, Colombia, that year, they were unusually held prior to the European Championships. Hartley was once more selected for Great Britain, this time being the team's only female skater. Her world performances were once again top 10 and she narrowly missed out on a bronze medal when she finished 4th in the 3000 metres. At the European Championships of the same year in Vienna, Austria, she was joined in the British team by domestic rival Lisa Smith. Smith had skated in the Junior European Championships earlier in the year in Birmingham coming away with two gold medals, but now senior was quickly starting to make her mark in this age group too. The 1984 European Championships were relatively successful for the British team with all five skaters bringing home medals (the men won gold in the relay on the road). Hartley's medal haul was a silver in the 3000 metres and bronze in the 5000 metres. Whilst this was in itself an achievement, the girls managed a fourth place in the three man relay - with only two of them!! Internationally 1985 was also a good year for Hartley. In the European Championships in Cassano d'Adda, Italy, she would take home three bronze medals. Two of these came from the road and track relays with an individual third place in the road 1500 metres. In fact, she competed in eleven out of a possible twelve events at these championships and would only finish outside of the top ten once - the 300 metres time trial on the road. The World Championships in Colorado Springs, USA, saw Hartley finally bring home a world medal. In the relay, Hartley was once again with Lisa Smith but this time it was Herne Bay's Lisa Burgess who would be the third skater. The trio secured a bronze medal in this event just behind USA and Italy. Towards the end of the 1985 skating season Hartley's domestic racing career was thrown into turmoil. Her father, Brian, who at that time was also skating for the Birmingham Wheels club, had a falling out with some of the other club members. At the club AGM a vote was conducted as to whether he should be allowed to continue to skate for Birmingham Wheels, with the outcome not a favourable one. Sticking with his father, Alison's brother, Richard, also relinquished his club membership. The question Hartley now had to ask herself was whether to leave and join her father or continue with the Birmingham Wheels club. After some soul searching she decided to stay with Birmingham Wheels and continue to be coached by arguably the best in the country. Hartley was again selected for Great Britain in 1986, but her form had dipped from previous years and her results at both Finale Emilia, Italy, in the European Championships and Adelaide, Australia, in the World Championships, were not her best. The issue surrounding her father and brother some months earlier may well have played a part in her performances, we may never know. But the simple fact is, is that it certainly could not have helped. In Italy her highest individual placing would be 8th whilst in Australia she could only manage 13th. By now she was also playing "second fiddle" to Lisa Smith back home who was now firmly on top of her game domestically and winning every single British title for the second year in succession, although Hartley's international performances were on a par with Smith who herself was not having the best of times internationally. Despite this the duo were strong enough as a pairing to take a bronze medal in the relay on the track in Finale Emilia. Returning from Australia, Hartley recognised that the training needed to go up another notch and her winter training program that year paid dividends. In 1987, domestically, her main rival was still of course Lisa Smith and although the record books will show that Smith won the British titles competed for on 4th and 5th July they do not paint the full picture. In the 3000 metres held on the Saturday Smith won it from Hartley by just 7/100th's of a second. As if that wasn't close enough the 1500 metres on the following day was even closer. It was a photo finish between the two skaters and despite being awarded the same time, it was Smith who was given the judges decision. At the European Championships in Ostende, Belgium, there were to be no individual medals but her performances of previous years were once again to the fore. Once again, the duo remarkably secured bronze in the relay on the track. At the World Championships, again no medals for Hartley, but she was firmly back in the top six and mixing it with the world's elite. The highlight of her year, however, was still to come. On 20th September the 300 metres time trial British Championship was held, and for the first time in her career she secured gold. This meant that she had now won every British Championship distance. At the end of 1987 she was once again on a high. Still only 20 years old, Hartley had plenty of time yet to realise her goals. However, in 1988 things would take another dramatic turn in her life. In early July the first Indoor British Championships for a generation was held. Hartley finished second to Smith in the 1000 metres and later that day the team was announced for the forthcoming European Championships in Gujan Mestras, France. The newly appointed Team Manager was John (Dai) Davis, and controversially he left Hartley out of his selection, opting just to take one woman, Smith. Very soon afterwards Hartley announced she was expecting her first child which Davis later used to vindicate his decision. It would be another 5 years before Hartley returned to international skating. The 1988 and 1989 seasons for Hartley didn't happen for obvious reasons. She was now a young mother and her priorities were now with her new family. However, it was not long before the lure of speed skating came calling once more. Returning to training in the winter of 1989, Hartley again worked hard to get her fitness back and to find some of the form she had enjoyed a few years previously. Again, the hard work paid off and in July 1990 won every British title available to her in a single season. This was the first time she had achieved this and was another feather in her cap in her already illustrious career. Unfortunately, her domestic performances did not warrant inclusion into the national team. Despite her successes, Team Manager and sole selector, Dai Davis, felt that her opposition domestically had been weak (Smith had taken a sabbatical from competition at the end of 1989) and was therefore not worthy of selection for international competition. In fairness, he may have been right. After all, she had only been back in serious training for a little over 6 months after a 2 year lay off. By the start of the 1991 season Hartley found herself pregnant again. Her second child was born in August that year resulting in another year out for motherhood. Undeterred, Hartley again found time to train through the winter. By the time the British Championships came round again in 1992 she was again back to winning ways. 1992 also saw the re-emergence of her old rival, Lisa Smith, herself now a mother. At the British Championships the years rolled back as the two rivals once again did battle. The sprint distances were, in fact, won by Derby's Sarah Atkins, but the longer distances were fought out between Hartley and Smith. Smith would win the 1500 metres whilst Hartley took gold in the 3000 metres and 5000 metres. For Smith, this would effectively be her farewell to the sport, whilst for Hartley it was the start of a whole new chapter. Again she was deemed not yet ready to return to international competition and so the British team for the European and World Championships of 1992 was a men only affair. In 1993, however, that would change. Between 1992 and 1993 the world of speed skating saw the most dramatic change in it's long established history. Inline speed skates had been introduced at World level in 1992 and then at European level in 1993. If you wanted to move with the times the only way forward was to own (and race on) a pair of inline skates. They didn't suit everybody and for a brief period the crossover from traditional skates to inline skates were dominated by a very select few. Either the Dutch skaters who had been on them for years but had never really competed in major international events, or a minority of skaters from other nations who had worked hard to master inlines (the likes of Frenchman Alain Negre or the Muse brothers from USA for example) or who had simply been using these skates for some time in other walks of life but had largely gone unnoticed by their national federations (the likes of Italy's David Mariani being amongst this category). For Alison Hartley, she found the switch a struggle. The British national Team Manager for 1993 was Hugh Doggett. Hartley's domestic performances leading up to team selection had impressed him (again she won all British titles available to her) and he duly selected her for the forthcoming European Championships in Valence d'Agen, France. Hartley would make sure her inclusion was the right decision. Fortunately for Hartley, it was still early days for inlines and although on the track some races were deemed "open" (that is to say either inlines or traditional skates could be used), almost everybody used traditional skates believing that they were quicker on a banked track. Having not skated in a major international for six years, Hartley proved that her strength and class had not left her since her last time out in a British shirt. Skating all distances, track and road, she would finish in 5th place no fewer than three times, with her other placings well inside the top ten. Her big disappointment came in the 8000 metres on the track when she crossed the line 3rd only to find she had been disqualified in favour of a local French girl, Sandrine Plu. It was a devastating blow to Hartley, but one that she didn't let phase her for the other events. Doggett stepped aside for the 1993 World Championships in Colorado Springs, USA that year, in favour of Tony Wordsworth, aided by John E. Fry. Hartley was again selected but despite her selection she decided that she was not going to attend these Championships and remain at home with her family. Little did she know at that time that her last race in Valence d'Agen would be the last time she skated for Great Britain in a major international competition. 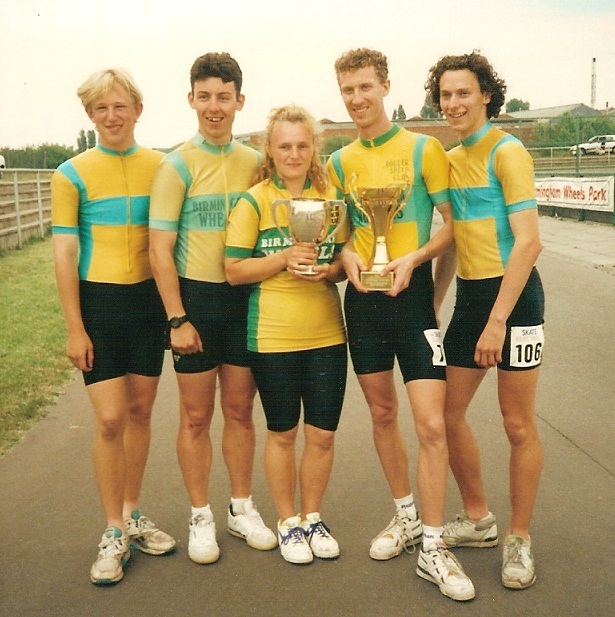 By the time the 1994 domestic season came around there were new faces to be seen in the senior women's age group. Hartley was now 27 and not only was her competition almost a decade younger than her, but they had grown up using inline skates and knew nothing else. Hartley was still mastering these new skates and still finding out ways of making them work for her. A lot of training time was taken up not only with fitness and technique, but also with experimentation with skate set up and wheel technology. Despite these distractions Hartley was still picking up medals in her racing but once again the British federation decided that no women would be selected for major international competitions that year. At the British Championships, a young Hayley Mepham from Derby was starting to make a name for herself. She had already won the Ladies Half Marathon title in May and by September was sweeping all before her. Hartley was consistently finishing second behind Mepham, but with an iron will and determination that had surfaced many times over the years, she prevented a clean sweep by the Derby girl and duly won the 3000 metres. In 1995 Hartley was again crowned British Champion, when she won the Ladies Half Marathon in Hereford in May. It was to be her 19th and last senior British Championship victory. Hartley attended a 'B' international that year in Gijon, Spain and was later selected for the European Championships that were to be held in Praia da Vitoria, Azores - Portugal. Once again, she declined the offer, possibly recognising that she was no longer the force she once was and that she was not prepared to be looked upon as an "also ran". The sport had moved on both nationally and internationally and Hartley knew that on the major international scene her time was up. For a period after 1995 she made fairly frequent returns to the track, more often than not to compete in British Championships. She had always maintained her fitness and above all her competitive nature. Her efforts in both 1997 and 1999 earned her a number of silver medals in Championship events, but that elusive 20th gold medal remained just out of reach. Some may say that her performances were an indictment of mediocre standard of women's skating now apparent in Britain, and they may well be right, in part at least. But what should not be taken away is Hartley's unswerving dedication to her task and an almost obsessive desire for victory. In a career spanning 25 years she had been a worthy successor to the likes of former British internationals, Chloe Ronaldson, Pat Eason and Pat Barnett. Alongside Lisa Smith she had been synonymous with an era within British speed skating. The two great rivals had spurred each other on to great achievements, but on the 24th October 1999 when aged 32 she finished second to Sara Dally in the Ladies British Half Marathon Championship at Chesterfield, Alison Hartley stepped off the track for the very last time. As she did so she stepped into the history books and became the last of the great British women speed skaters.